Symphyotrichum chilense is a robust and spectacular California Native perennial. The Pacific Aster sends up arching stems to 5 feet or more tall and steadily spreads, often a foot or more in every direction if water is available and only a little less if it is not. Symphyotrichum chilense grows well in boggy locations but still performs quite well when the bog dries out in the Summer. In the Fall the pale blue ray flowers with yellow cone flowers in the center attract a huge number of bees, including many native species, and butterfiles. Each Winter I cut the Pacific Aster to the ground just as the new shoots start to show above the soil. Aster chilensis Point St George and Aster chilensis Purple Haze are both dwarf varieties that generally stay below 3 feet but still spread enthusiastically. Symphyotrichum chilense this Winter was unphased when a cold snap took our Winter temperatures down into the low teens or single digits. The California Aster is a nectar source for the adult Gray Hairstreak, Painted Lady, Fiery Skipper, California Dogface Butterfly, Cloudless Sulfur, and the Mournful Duskywing. 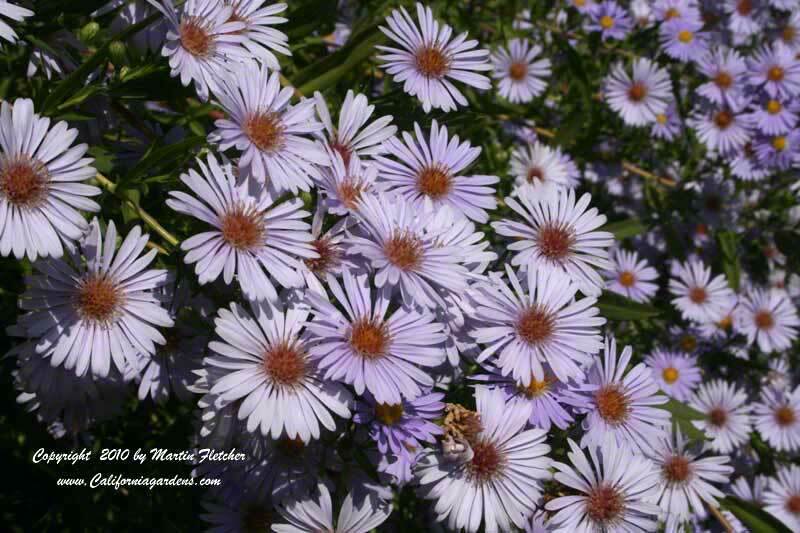 The California Aster can be found throughout most of California near streams and grasslands up to 4500 feet elevation. Blue flowers of Symphyotrichum chilense - Aster chilensis, California Aster. High resolution photos are part of our garden image collection.